Flowers for weddings and celebrations are a visual expression of sharing your joy and love. The wedding flowers and designs you choose go beyond just words as a way of expressing your feelings with those you love for all the important events of a lifetime. 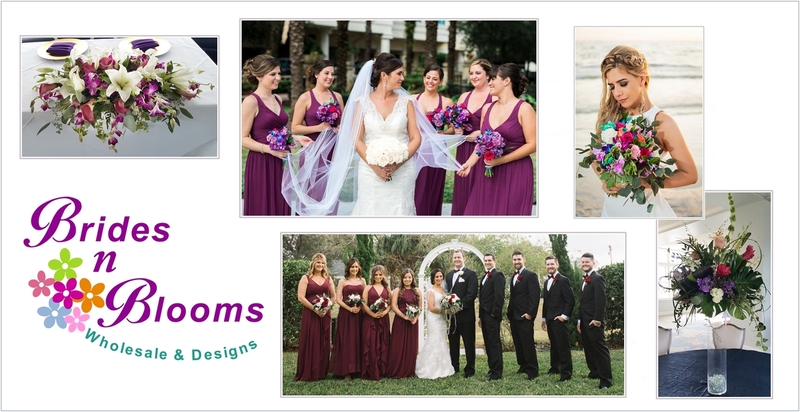 If you’re planning a Wedding, Bar/Bat Mitzvah, Anniversary, Birthday, Graduation, Quinceañera, Sweet Sixteen, Corporate and Club Event, or any of life’s important celebrations, schedule a consultation with Brides N Blooms, Designs division today. We look forward to being your personal connection to all things floral. We are proud to be affiliated with some of Tampa Bay’s best venues for weddings and celebrations. Don’t know what your floral budget should be? We understand most everyone who is planning an event has no idea what flowers cost, or how much should they spend on them! Though the bottom line amount should not necessarily be the only criteria for choosing a floral designer, we do understand that the budget is an important factor. Great customer service is essential as well as confidence in your designer understanding your vision, your desires and price range. For a wedding, flower budgets can vary greatly. Typically, you should plan on spending about 8% – 10% of your overall budget. This percentage will depend on the bride’s bouquet, how many bridesmaids’ bouquets, boutonnieres, and corsages are needed, as well as, any ceremony, reception decor and floral arrangements are needed. How much you actually spend does include other factors, such as how costly the type of flowers you choose are, the size and complexity of the decor and/or arrangements, and how far the flowers must travel to the ceremony and reception. Choosing a location for a wedding or celebration? Brides N Blooms Designs has a working relationship with all the above locations. We are also available to serve any location in the Tampa Bay Area and our preferred vendor affiliations are growing day by day. We have a network of vendors we can refer to you! If you choose to have a consultation with us or multiple vendors at your location to coordinate colors, looks, themes and ideas we can do that too! Whatever your ultimate dream event is, Brides N Blooms, Wholesale & Designs can help, If you are a DIY host looking for flowers to create your own designs, our wholesale division can help. If you are working with an event planner who will be designing your event, we can work with them as well. There are plenty of choices in our floral collections or we will create something just for you. How ever you choose to incorporate beautiful flowers at your event, we will work together with you to give you the look you desire at a pricing that will fit your budget.